To post a classified ad, please send your ad text (including contact information) to ABA's Liz Button. 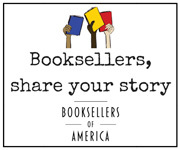 Classified ads appear on this page and in ABA's Bookselling This Week newsletter. ABA bookstore members receive up to four free classified ads per year. More information about advertising with ABA can be found here.